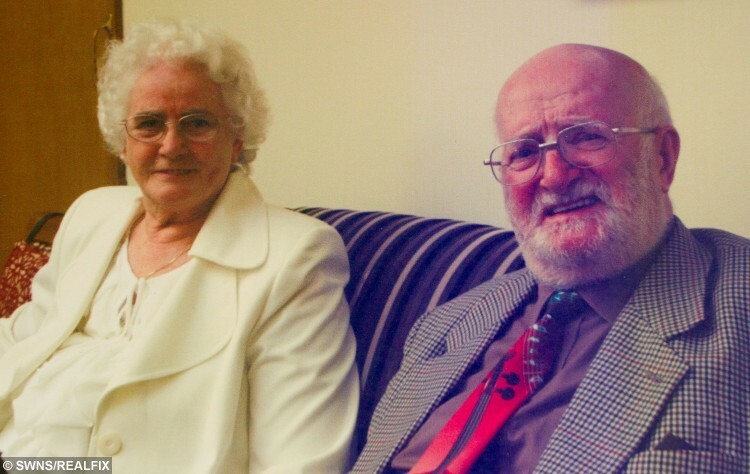 A devoted couple have defied the odds to reach their 60th wedding anniversary after beating cancer four times and surviving 19 HEART ATTACKS. David Emery, 81, and wife Muriel, 86, tied the knot on May 14, 1955 but have seen more health scares than most during their marriage. Muriel has beaten breast cancer twice while her husband has fought off bowel cancer and Hodgkin’s lymphoma – as well as a staggering 19 heart attacks. The brave couple have put their determination to overcome the deadly conditions over the years down to simply wanting to be there for one another. 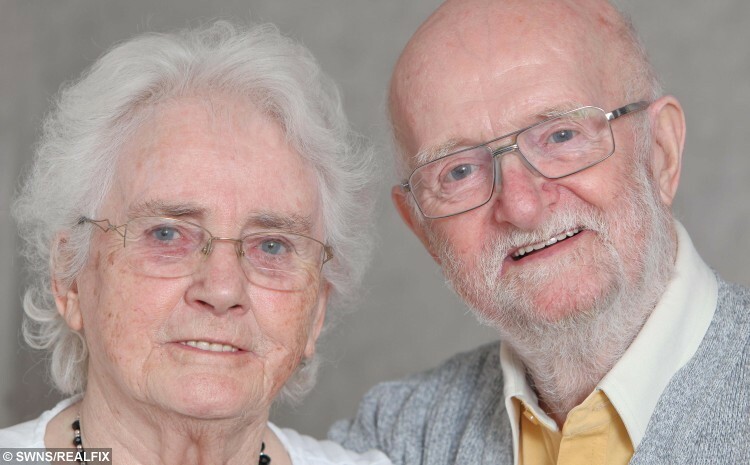 Last week the star-crossed couple from Stourbridge, West Mids., celebrated their diamond wedding anniversary with a meal with friends and family. But it was a milestone they never thought they would reach following an incredible story of survival, which began 43 years ago. In 1972 David suffered a heart attack at the age of 39 at his home and had two more before Muriel was diagnosed with breast cancer in 1988. 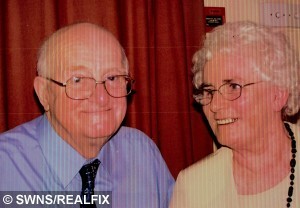 He suffered four more heart attacks in his lates 50’s and early 60s and was diagnosed with bowel cancer in 2002. After beating the disease he was told he had contracted Hodgkin’s lymphoma before Muriel was told her breast cancer had returned in 2005. Two years later David miraculously survived FIVE consecutive heart attacks in one go while Muriel celebrated overcoming cancer for a second time. He was given a defibrillator implant and has only suffered one heart attack since – but did miss the date of his wedding anniversary because he was in hospital with gallstones. Muriel added: “The doctor’s can’t believe his history of heart trouble, they look at his record and think it’s a typing error. “He’s gone through so much, and yet he’s always so positive. He’s wonderful. “I think our secret to being so happy is that it has very much been a give-and-take relationship. “We have been through thick and thin and having such a supportive family has only made us stronger. 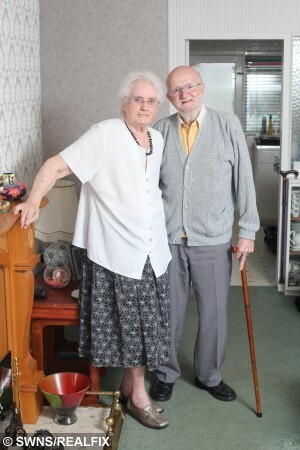 “We never thought we’d make it to 60 years – I’ve never thought we were unlucky, you’ve got to be positive. “I think that’s the most important thing for anyone battling health problems. David and Muriel have two children, David, 56, and Alison, 54, as well as five grandchildren, Louise, 30, Hannah, 30, Heather, 26, Alex, 24, and Chloe, 19 and two great-grandchildren. Muriel added: “To celebrate our anniversary, my children took me on the Severn Valley Railway for an evacuee day, because I was an evacuee in the war. 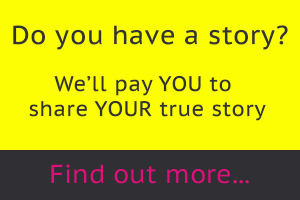 “My husband was meant to come, but he was in hospital – we thought he’d had another heart attack, but in fact he had gallstones. “He keeps me on my toes really. David suffered his first heart attack while he was gardening at their home in 1972. Muriel recalled: “He looked terrible but it was our then teenage son, David, who dialled 999 while I got the vacuum out to tidy up. “It was quite funny – we’d had a dinner party the night before so I just wanted the place tidy for when the ambulance arrive. The smitten couple met when they were 18 and 22 and married three years later at St Matthew’s Church, Smethwick, West Mids. 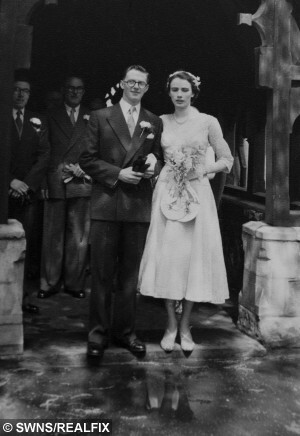 They had to organise the whirlwind wedding in just a week, as David was shipping out to Malaya for his national service, working as an air wireless fitter in the RAF. Muriel worked as a secretary at Scribban-Kemp Ltd, a bakery factory based in Smethwick. When David returned from Malaya in 1956, he worked as a research chemist for Birmingham City University before starting his own business running fatigue testing in 1975. David added: “I do consider myself particularly lucky after whats happened over the years – I’ve survived everything they’ve thrown at me. “They don’t get any easier, a heart attack is a massive shock every time. “I’m beginning to believe I have things under control now though, the healthcare has improved so much and I’m a great believer in our local hospital. “But the most difficult part of it is seeing others who aren’t so lucky. “My wife and I always seem to come out on top, and we’re incredibly grateful for that, but you feel so sorry for the others who aren’t so lucky.